MetalRockNews: Slayer's Kerry King: "Iron Maiden and Metallica are living on past success"
Slayer's Kerry King: "Iron Maiden and Metallica are living on past success"
Slayer guitarist Kerry King was recently interviewed by RVAMag, you can read some excerpts below. About the crisis crisis in hard rock and heavy metal right now, he said: "We definitely thought about not releasing new music anymore. 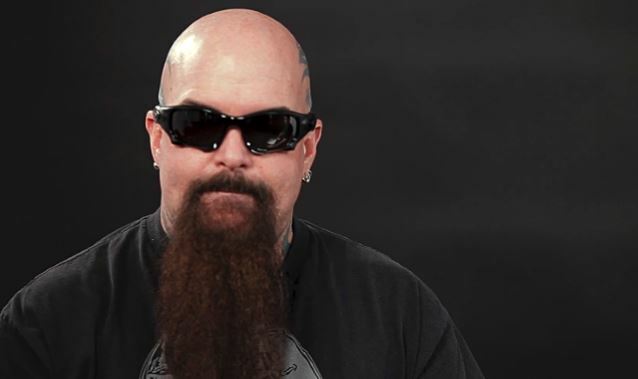 Maybe even doing what Down did and just release four songs before every tour, but, really, until the time comes that albums are obsolete, you better believe Slayer's going to be making records." He continued: "We're living on our history for sure, but so is everyone else, yet we're the ones trying to push ourselves forward. I would say Iron Maiden and Metallica, no offense, are living on past success. Metallica has toured forever on the 'black' record which a lot of people don't like. I actually like it. It's heavy as can be. Is it 'Master Of Puppets'? Of course not, but it's a great record. Iron Maiden, for me, is living off their first three records. Have they made good songs since then? Yeah, but they haven't made great records. I like to think we're still making great records and as much as people come out wanting to hear 'Raining Blood' and 'Angel Of Death', they also want to hear 'Disciple' or even 'Implode'." He said that records aren't selling quite at the level they used to, giving bands and labels little incentive to produce new music: "It's true, but it's just a sign of the times because people get their music differently. It's not all about SoundScan anymore. That's the last thing I remember, because you remember what you had growing up. There's different technologies and different ways of doing a number of things, but when I grew up, I knew SoundScan and we are way off of SoundScan now. That's because people get music for free. One person downloads it and shares it with five people. It's not the same as it used to be. I can't be bitter about it because that's just how time has changed." He added that Slayer's success is measured through concert attendance and not through record sales: "My barometer is the live show where people show up. That means people are into the music, whether the record is selling or not. They have it, they know it, and we can play it and have them sing it right back to us. That's pretty much how it shows me people are still into, regardless of sales."